Win freebies and exclusive tickets from Couture Troopers! Check back later for new giveaways. 3 pairs of preview tickets to FIFTY SHADES DARKER at GV Great World City are up for grab! Contest details: To win a pair of tickets to the premiere screening, simply watch the trailer (https://www.youtube.com/watch?v=p32RqQ3xxAY&feature=youtu.be), tag a friend in the Facebook post, and comment with the Singapore release date of FIFTY SHADES DARKER in a comment. Each winner will also receive a limited edition mask (as seen on Dakota Johnson in the movie). They can also look forward to some exciting pre-screening activities on 8 February 2017! 20 pairs of preview tickets to ALLIED at Shaw Theatres LIDO are up for grab! Contest details: To win a pair of tickets, simply watch the trailer (https://www.youtube.com/watch?v=2gytNkKgX-M), tag a friend in the Facebook post, and comment with the Singapore release date of ALLIED in a comment. About the movie: Tom Hooper, the award winning director of Les Misérables and The King’s Speech, is back again with his new pseudo-biographical drama film The Danish Girl, which chronicles around the remarkable love story between artists Lili Elbe and Gerda Wegener. In cinemas on January 7, 2016, the highly-rated film stars both Academy Award winner Eddie Redmayne and Golden Globe contender Alicia Vikander. Contest details: Stoked for FiDé Fashion Weeks 2013, especially the sensational Couture Week? We bet you are! So guess what, we have 6 pairs of exclusive tickets to ATELIER CHARDON SAVARD fashion show to give away! To qualify for this draw, all you have to do is to like this photo on our Facebook Page and tell us who is your favourite designer amongst the five in the photo comment. Event information: A fashion show set to be the platform for the stunning and exceptional dresses and looks. They are conceived by 5 winning designers of this year’s graduating batch from the French fashion school, Atelier Chardon Savard, namely Elie Grandjean, Nofar Gabrieli, Odessa, Soleyanne Baland and Timothé Grand-Chavin. Their designs are poised to intrigue your senses in all means possible, even in technical and aesthetic showmanship. Event information: From 7 countries to 12 contestants, and to a showcase of million brilliant fashion design ideas, watch as these talented fashion designers from the region whip up in the finals of the competition, where a spectacular showcase of tantalising collections awaits you. Contest information: With only a week away to the prestigious French Couture Week 2012 Singapore, we are stoked to be giving away EXCLUSIVE tickets (with total worth of $960) to On Aura Tout Vu BY LIVIA STOIANOVA AND YASSEN SAMOUILOV show on 2 December 2012, 7pm at Marina Bay Sands. From 18 till 23 November 2012, you can stand a chance of winning a pair of ticket to this highly-anticipated show. All you have to do is LIKE the photo on our Facebook Page and SHARE the post with an answer to this question: WHAT IS THE MEANING OF ‘ON AURA TOUT VU’ ? 10 lucky winners will be randomly selected from those who ‘LIKE’, ‘SHARE’ and answered the question correctly. This is once-in-a-lifetime opportunity that you wouldn’t want to miss, so what are you waiting for? Contest information: In celebration of L’ILE AUX ASHBY’s newly-launched website, we are giving away a pair of ring each to 5 lovely readers. All you have to do is to LIKE the photo (and our page!) and SHARE the post on your wall from 16 till 19 May 2012. 5 winners will be randomly selected from the people who “like” & “share” the picture. What are you waiting for? Winners to be notified by 20 May 2012 via Facebook Message. Rings would be mailed out to the mailing address provided. Alternatively, winners can also collect the ring from L’ILE AUX ASHBY’s Pop-Up Store at Best of British (B.O.B.) Showroom which runs from 13 till 14 July 2012. Contest details: Stand a chance to win a pair of 2 tickets to the CIRQUE MOTHER AFRICA on the Grand Opening Day (worth $68 – 88 each)! All you have to do is to LIKE the Facebook photo (and our page!) and SHARE the post on your wall from 13 till 29 February 2012. A winner will be randomly selected from the people who “like” & “share” this picture. What are you waiting for? 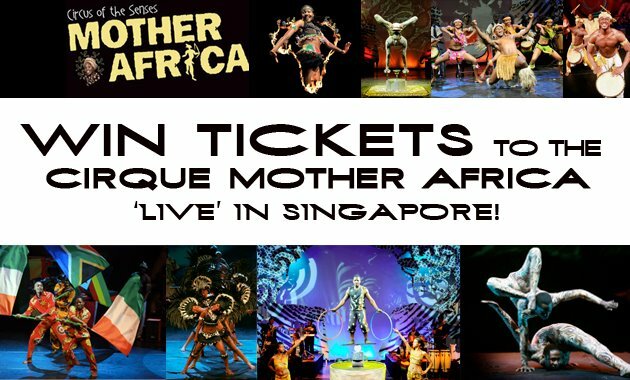 Do note that the Cirque Mother Africa Ticket Giveaway is only open to those who reside in Singapore and those who will be in Singapore from the period of 12 – 15 April 2012. Event Information: For the first time in Singapore, the highly acclaimed and anticipated CIRQUE MOTHER AFRICA, which will be showing at the Esplanade Theatres from 12 – 15 April 2012, will thrill, entice, excite, entertain and even surprise you, with jaw-dropping acts and gravity-defying stunts.